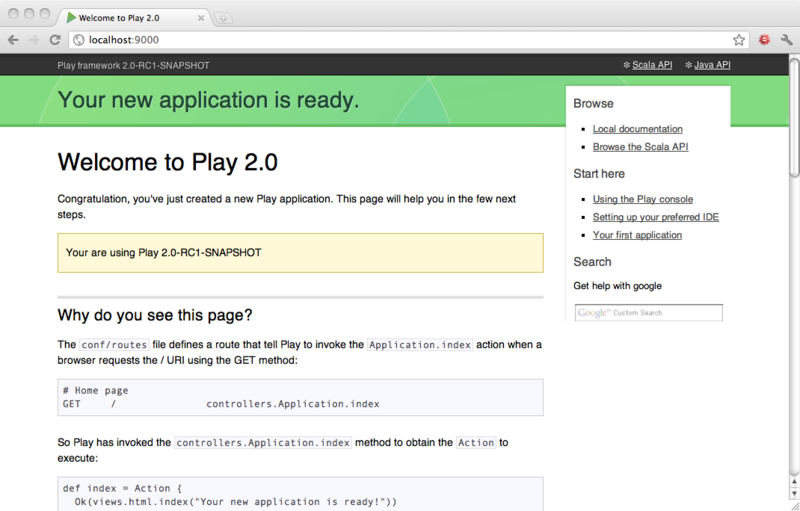 Let’s write a simple to do list application with Play 2.0 and deploy it to the cloud. You will of course need a text editor. You can also use a Scala IDE such as Eclipse or IntelliJ if you like. However, with Play you can have fun working with a simple text editor like Textmate, Emacs or vi. This is because the framework manages the compilation and the deployment process itself. Now that Play is correctly installed, it’s time to create the new application. 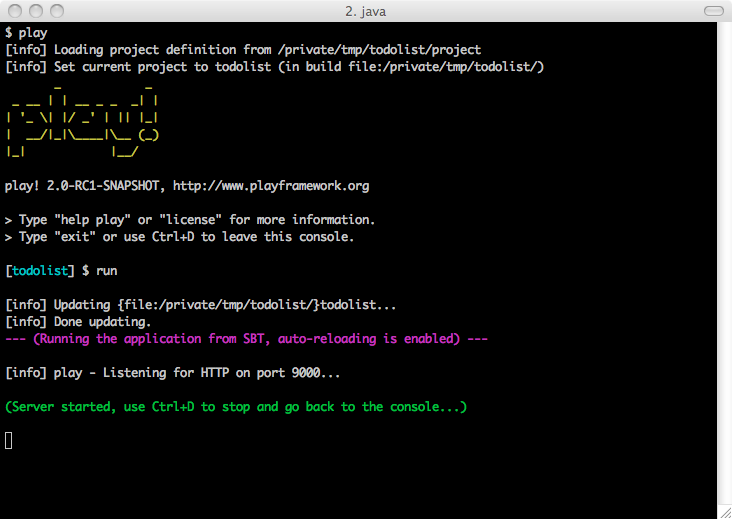 Creating a Play application is pretty easy and fully managed by the Play command line utility. That allows for standard project layouts between all Play applications. It will prompt you for a few questions. 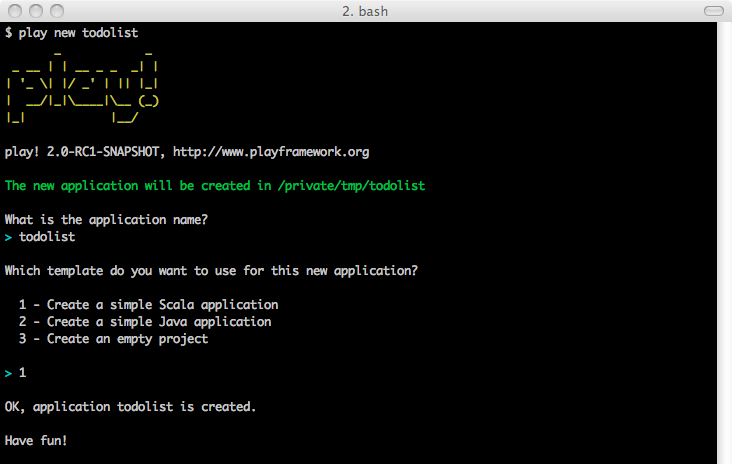 Select the Create a simple Scala application project template. app/ contains the application’s core, split between models, controllers and views directories. This is the directory where .scala source files live. project contains the build scripts. The build system is based on sbt. But a new Play application comes with a default build script that will just work fine for our application. test/ contains all the application tests. Tests are written as Specs2 specifications. Because Play uses UTF-8 as single encoding, it’s very important that all text files hosted in these directories are encoded using this charset. Make sure to configure your text editor accordingly. That simply tells Play that when the web server receives a GET request for the / path, it must retrieve the Action to execute from the controllers.Application.index method. 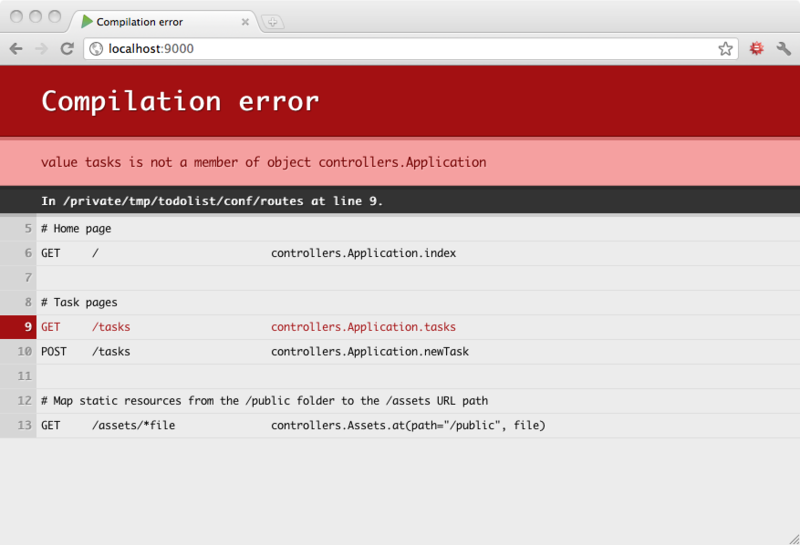 You see that controllers.Application.index returns an Action that will handle the request. An Action must return a Result that represents the HTTP response to send back to the web browser. Here the action returns a 200 OK response filled with HTML content. The HTML content is provided by a template. Play templates are compiled to standard Scala functions, here as views.html.index(message: String). The first line defines the function signature. Here it takes a single String parameter. Then the template content mix HTML (or any text based language) with Scala statements. The Scala statements starts with the special @ character. There is no need to compile the code yourself or restart the server to see the modification. It is automatically reloaded when a change is detected. But what happens when you make a mistake in your code? As you see errors are beautifully displayed directly in your browser. For our to do list application, we need a few actions and the corresponding URLs. Let’s start by defining the routes. We create a route to list all tasks, and a couple of others to handle task creation and deletion. The route to handle task deletion defines a variable argument id in the URL path. This value is then passed to the deleteTask method that will create the Action. As you see we use TODO to define our action implementations. Because we don’t want to write the action implementations yet, we can use the built-in TODO action that will return a 501 Not Implemented HTTP response. As you can see, we use Redirect instead of Ok to specify a 303 See Other HTTP response type. 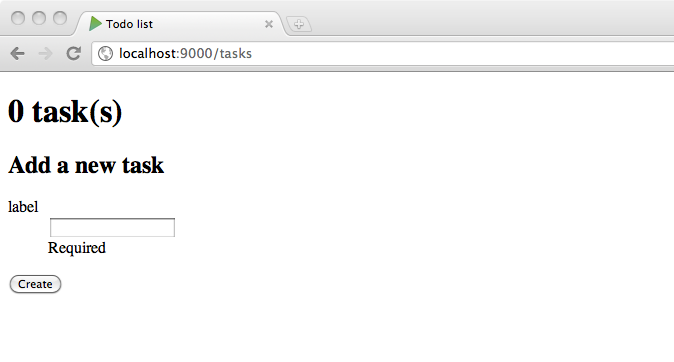 We also use the reverse router to get the URL needed to fetch the tasks actions. We have also created a companion object to manage Task operations. For now we wrote a dummy implementation for each operation, but later in this tutorial we will write implementations that store the tasks in a relational database. We also imported helper._ that gives us the form creation helpers, typically the form function, which creates an HTML <form> with filled action and method attributes, and the inputText function that creates an HTML input for a form field. The type of taskForm is then Form[String] since it is a form generating a simple String. You also need to import some play.api.data classes. This renders a 200 OK result filled with the HTML rendered by the index.scala.html template called with the tasks list and the task form. To fill the form we need to have the request in the scope, so it can be used by bindFromRequest to create a new form filled with the request data. 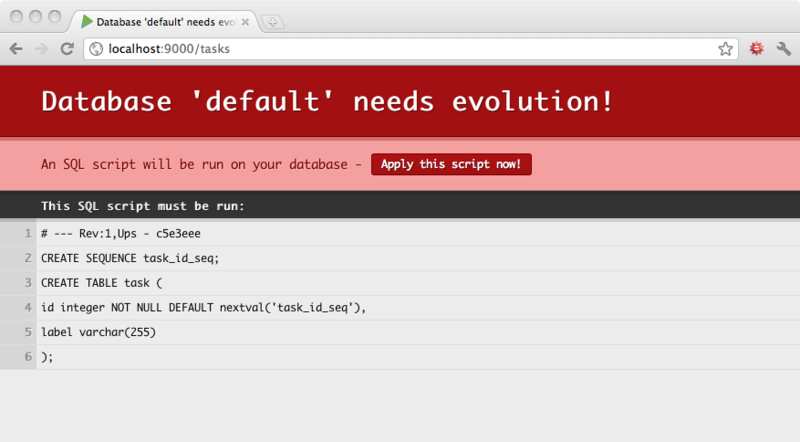 If there are any errors in the form, we redisplay it (here we use 400 Bad Request instead of 200 OK). If there are no errors, we create the task and then redirect to the task list. Just click the Apply script button to run the script. Your database schema is now ready! Note: Read more about Evolutions. Here, task is a parser that, given a JDBC ResultSet row with at least an id and a label column, is able to create a Task value. We use the Play DB.withConnection helper to create and release automatically a JDBC connection. Then we use the Anorm SQL method to create the query. The as method allows to parse the ResultSet using the task * parser: it will parse as many task rows as possible and then return a List[Task] (since our task parser returns a Task). Now you can play with the application; creating new tasks should work. Note: Read more about Anorm. 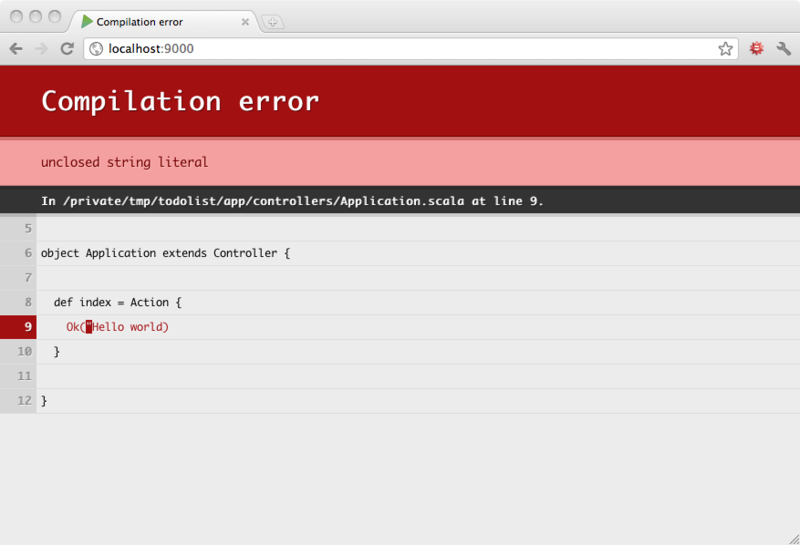 We use system properties to override the application configuration, when running on Heroku. 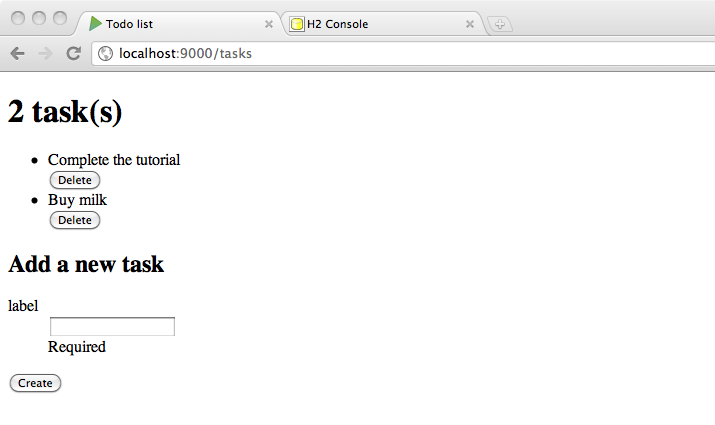 Since Heroku provides a PostgreSQL database, we need to add the required driver to our application dependencies.